The Carbon Offsetting and Reduction Scheme for International Aviation (CORSIA), a new carbon market established under the International Civil Aviation Organization (ICAO), aims to compensate the growth in CO2 emissions from international aviation above 2020 levels, starting in 2021. ICAO must, therefore, identify which carbon offsets airlines can use to meet their obligations. This will be carried out by the Technical Advisory Body (TAB), which will assess existing GHG programs (i.e. offset providers) based on criteria which were formally adopted by the ICAO Council in March 2019. This briefing analyzes eight offset programs against one of the two sets of criteria adopted by the ICAO Council: the Program Design Elements. Information is based on publicly available documentation and, although not exhaustive, this screening provides insight into the general adjustments needed for all offset programs to meet CORSIA requirements. Our conclusion is that no program can yet operate in a manner which complies with all the eligibility criteria. Some will need to update and improve certain parts of their protocols or methodologies, but all are hampered by the lack of clarity on international accounting rules to avoid double counting of emission reductions. The present assessment also highlights that the Program Design Elements are not sufficient to exclude credits with no environmental value, and that a rigorous application of the second set of criteria, the Carbon Offset Credit Integrity Assessment Criteria, is necessary and will require analysis of specific methodologies and projects. 1. Clear Methodologies and Protocols, and their Development Process: Programs should have qualification and quantification methodologies and protocols in place and available for use as well as a process for developing further methodologies and protocols. The existing methodologies and protocols as well as the process for developing further methodologies and protocols should be publicly disclosed. 2. Scope Considerations: Programs should define and publicly disclose the level at which activities are allowed under the program (e.g., project-based, program of activities, etc.) as well as the eligibility criteria for each type of offset activity (e.g., which sectors, project types, or geographic locations are covered). 3. Offset Credit Issuance and Retirement Procedures: Programs should have in place procedures for how offset credits are: (a) issued; (b) retired or cancelled; (c) subject to any discounting; and, (d) the length of the crediting period and whether that period is renewable. These procedures should be publicly disclosed. 4. Identification and Tracking: Programs should have in place procedures that ensure that: (a) units are tracked; (b) units are individually identified through serial numbers: (c) the registry is secure (i.e., robust security provisions are in place); and (d) units have clearly identified owners or holders (e.g., identification requirements of a registry). The program should also stipulate (e) to which, if any, other registries it is linked; and, (f) whether and which international data exchange standards the registry conforms with. All of the above should be publicly disclosed information. 5. Legal Nature and Transfer of Units: The program should define and ensure the underlying attributes and property aspects of a unit, and publicly disclose the process by which it does so. 6. Validation and Verification Procedures: Programs should have in place validation and verification standards and procedures, as well as requirements and procedures for the accreditation of validators and verifiers. All of the above-mentioned standards, procedures, and requirements should be publicly disclosed. 7. Program Governance: Programs should publicly disclose who is responsible for administration of the program and how decisions are made. 8. Transparency and Public Participation Provisions: Programs should publicly disclose (a) what information is captured and made available to different stakeholders; and (b) its local stakeholder consultation requirements (if applicable) and (c) its public comments provisions and requirements, and how they are considered (if applicable). Conduct public comment periods and transparently disclose all approved quantification methodologies. 9. Safeguards System: Programs should have in place safeguards to address environmental and social risks. These safeguards should be publicly disclosed. 10. Sustainable Development Criteria: Programs should publicly disclose the sustainable development criteria used, for example, how this contributes to achieving a country’s stated sustainable development priorities, and any provisions for monitoring, reporting and verification. ● All reviewed programs will need to adapt their protocols to ensure compliance with the Program Design Elements of CORSIA. ● A more thorough qualitative review at a project or methodology level is needed to determine the effectiveness of CORSIA. Basic fulfillment of the program-level requirements should be complemented with a continuous quality assessment of transacted credits, e.g. through spot checks of randomly selected projects which issue CORSIA-eligible credits. ● In order to avoid double counting with other emissions reduction efforts, countries need to reach an agreement on international accounting rules, and programs should finalize the upgrading of their protocols to ensure that the credits they certify are not backed by double counted emission reductions. ● The Technical Advisory Body should apply the criteria fairly and consistently, be free from conflicts of interest, and require public meetings and public input during its deliberation of program and offset eligibility..
Posted: Saturday, March 16th, 2019. Filed in Blog, Climate Change News, General News, Recent News. The section relevant to aviation, under the heading “Clean growth” states: “The Budget 2018 set out how the government is accelerating the shift to a clean economy, building on the Industrial Strategy, Clean Growth Strategy, and 25 Year Environment Plan. The Spring Statement builds on this commitment: (several bullet points, of which the one relating to transport is: “to give people the option to travel ‘zero carbon’, the government will launch a call for evidence on Offsetting Transport Emissions to explore consumer understanding of the emissions from their journeys and their options to offset them. This will also look into whether travel providers should be required to offer carbon offsets to their customers.” Note, this is not only mentioning aviation. And nothing is settled, till there is the consultation – no date given for that. [ All this seems to mean is nothing whatsoever to cut demand for air travel. Most offsets are useless, and do not achieve cuts in carbon. (Aviation CO2 emissions are added to the atmosphere, cancelling out whatever savings were achieved by the offset created elsewhere). AW note]. The Spring Statement is an opportunity for the Chancellor to update on the overall health of the economy and the Office for Budget Responsibility’s (OBR) forecasts for the growth and the public finances. He also updates on progress made since Budget 2018, and launches consultations on possible future changes for the public and business to comment on. The Spring Statement doesn’t include major tax or spending changes – these are made once a year at the Budget. Environmental policies were at the centre of Philip Hammond’s attempts to woo younger voters in today’s Spring Statement, with the Chancellor unveiling a raft of new environmental initiatives covering housing, aviation, biodiversity, and energy efficiency. “Our challenge is to demonstrate to the next generation that our market economy can fulfil their aspirations and speak to their values,” Hammond said, in a nod to waves of public protests in recent weeks, including strikes by UK schoolchildren, urging the government to take more radical action to battle climate change. But Hammond insisted the solution to the climate crisis lies in driving innovation in the private sector. “As with the challenge of adapting to the digital age, so with the challenge of shaping the carbon neutral economy of the future, we must apply the creativity of the marketplace to deliver solutions to one of the most complex problems of our time, climate change, and build sustainability into the heart of our economic model,” he said. Much of the new action was focused on cutting carbon emissions from the UK’s housing stock, after the government’s climate advisors, the Committee on Climate Change (CCC), warned earlier this year that UK homes fall well short of standards needed to meet climate targets. The Chancellor today said he would adopt the CCC’s advice to end the use of fossil fuel heating systems in new homes from 2025 under a ‘Future Homes Standard’, with green alternatives such as heat pumps instead being installed as standard in all new homes. The standard will also require “world-leading” levels energy efficiency, the Chancellor said, adding that it will “deliver lower carbon and lower fuel bills”. Hammond also said the government will launch a consultation later this year on increasing the proportion of ‘green gas’ onto the grid, in a bid to reduce UK use of natural gas. Meanwhile, the Chancellor confirmed plans to require developers to deliver a “biodiversity net gain” for new domestic and commercial buildings. Under the programme potential development sites will be ranked according to their current environmental importance, with developers then required to demonstrate an improvement in biodiversity by planting more trees for example, or creating green corridors to protect wildlife habitats. Where green improvements cannot be made, developers will be liable to fund habitat protection and restoration schemes elsewhere in the country. “Following consultation the government will use the forthcoming Environment Bill to mandate biodiversity net gain for development in England, ensuring that the delivery of much-needed infrastructure and housing is not at the expense of vital biodiversity,” Hammond confirmed. Hammond was keen to point out there is “an economic, as well as an environmental case for protecting the natural world”, adding that later this year the government will launch a global review into the link between biodiversity and economic growth, headed by Professor Sir Partha Dasgupt from the University of Cambridge. During the statement the Chancellor repeatedly stressed the pressures Brexit uncertainty is wielding over the UK economy, describing last night’s vote on the Withdrawal Agreement as leaving a “cloud of uncertainty hanging over our economy”. He raised pressure on MPs to vote for May’s deal by declaring a ‘deal dividend’ could boost the money available to departments under the upcoming Spending Review, namechecking environmental spending as a key area. During his address Hammond also announced more support for small businesses to cut their energy bills – a move first mooted in the Autumn Budget last year. The Call for Evidence, published today, reveals the government is considering three options for a new energy efficiency scheme for small business: an energy efficiency auction where suppliers could bid to deliver energy efficiency measures in smaller businesses; a business energy efficiency obligation (EEO) to require energy suppliers or network operators to deliver energy savings for small businesses; expanding access to green loans to help firms pay for retrofitting measures. Hammond also said he would launch a call for evidence on Offsetting Transport Emissions, which will consider whether travel providers such as airlines should be forced to offer carbon offsets. Hammond promised any scheme would have to offer “genuinely additional offsets” to avoid double counting issues. In response to the green announcements, Shadow Chancellor John McDonnell slammed the government’s past record on environmental policies. He also questioned whether measures such as voluntary offset schemes would be robust enough to deliver real emissions savings: “A review of carbon offsets might reveal that they do not reduce emissions, and offsetting schemes like the Clean Development Mechanisms have been beset by gaming fraud,” he said. Others said the Chancellor didn’t go nearly far enough in his promise to “build sustainability into the heart of our economic model”. However, others welcomed the Chancellor’s fresh focus on environmental issues. Posted: Wednesday, March 13th, 2019. Filed in Blog, Climate Change News, General News, Recent News. Heathrow Airport has placed a €650m (£558.9m) bond with only weeks to go before the UK is due to leave the European Union. The 15-year bond was backed by current and new investors, which were mostly European, and reached an order book in excess of €2.8bn (ie. there was demand of that amount). Heathrow said the high demand for the bond “shows investor confidence in Heathrow’s expansion plans and resilience ahead of Brexit.” The bond means Heathrow hopes to extend the duration of its debt portfolio – ie. taking more time to pay it all back – for its 3rd runway expansion plans. It said the funds will be used on day-to-day corporate spending. The airport’s director of treasury and corporate finance, said: “The transaction delivers on our strategy of further diversification, longer duration and stronger liquidity.” Heathrow hopes, at the earliest, that the runway might open in 2026 – but it has a large number of hurdles to overcome before them, including the long DCO (Development Consent Order) process, that is the equivalent of a planning application, but for a vast project – with the decision taken out of the hands of the local authority, and made by government instead (a process devised to avoid the sort of long delays they had on Terminal Five). Heathrow Airport has placed a €650m (£558.9m) bond with only weeks to go before the UK is due to leave the European Union. The 15-year bond was backed by current and new investors, which were mostly European, and reached an order book in excess of €2.8bn. The airport said the high demand for the bond shows investor confidence in Heathrow’s expansion plans and resilience ahead of Brexit. The move drives forward Heathrow’s strategy to build strong positions in core markets and extend the duration of its debt portfolio ahead of the airport’s third runway expansion, and the funds will be used on day-to-day corporate spending. Sally Ding, Heathrow director of treasury and corporate finance, said: “The overwhelming support received from investors 23 days before the Brexit deadline clearly signals Heathrow’s robustness and strong global investor support as we gear up for growth. “We are extremely pleased to re-access the long-dated Euro market two years after our last issuance. “The transaction delivers on our strategy of further diversification, longer duration and stronger liquidity. The London airport was given the go-ahead to proceed with its long-awaited third runway last year, however, it is facing a legal challenge from nearby local authorities. Heathrow will conduct a public consultation in June ahead of submitting a planning application next yet, with the runway anticipated to open in 2026. Heathrow has blown more than £6bn in interest on its debts over the past 12 years, a Mail investigation has found. It spends more than £500m a year on interest payments alone, accounts for Heathrow Airport Holdings show. Meanwhile its debt pile has risen to £13.4 billion – about the cost of aa possible 3rd runway. Heathrow is planning to spend around £14 billion on the project, but its mammoth debts reveal just how stretched the airport has become. Airline bosses fear Heathrow may not be able deliver the runway on budget, and want Heathrow to guarantee not to increase these to pay for the runway. While it has paid more than £6 billion in debt interest over 12 years, shareholders have extracted £3.6 billion in dividends. Heathrow makes money by charging landing fees to airlines, which are passed on to passengers – around £22 for each fare. The airport is planning to spend £33 billion on infrastructure in coming decades – including the runway and terminals to serve an extra 52m passengers a year. Most of the work is due to be completed by 2035, and there is growing concern that the airport will have to raise charges significantly to pay the bills. Heathrow’s CEO John Holland-Kaye has raised nearly £1bn in debt to keep it going through a “worst-case scenario” following a hard Brexit. He said this was equivalent to 2 full years’ funding, to give the airport the level of financial resilience for a worst-case scenario. He said he expected “something close to continuity” through a Brexit agreement, but “our funding levels . . . mean we are protected. Even if we have no income for two months, we would be financially safe.” The debt deals, primarily refinancing, total £981m and take Heathrow’s total net debt to £13.7bn. A financial commented that this was an attitude of “let’s raise it while we can”, and a hard Brexit might raise fears over access to financial markets. Heathrow’s first half financial results showed a 2.3% increase in total revenue to £1.4bn compared with the 2017, but a 7% fall in pre-tax profit to £289m. Heathrow had spent money on more operational investment, such as in facilities for disabled passengers and in keeping the airport going during snows this winter. Passenger numbers rose 2.5% to 38.1m, its busiest ever first half, by use of higher load factors. Heathrow expects to spend £160m this year on the expansion project. Posted: Thursday, March 7th, 2019. Filed in Blog, General News, News about Airports, Recent News. Local MP Ruth Cadbury has joined Chiswick campaigners against Heathrow expansion who say they are angry at the airport’s failure to hold a local consultation on changes which will significantly affect W4, particularly north Chiswick. The airport’s current round of consultation events (Airspace And Future Operations ) features events in Hammersmith, Ealing and Hounslow Civic Centre, but none in Chiswick. This is despite the fact that the area faces significant potential disruption by proposed changes to flight paths or changes to respite periods even without a third runway. With a 3rd runway, the area will be intensely overflown by planes arriving to the new north runway, from the east. Campaigners say the level of low flights directly over the North Chiswick area area could reach 47 per hour (almost 1 per minute). It is likely that, with a 3rd runway, an estimated 35,000 residents could be affected. They consider that Heathrow is avoiding holding events in areas where opposition is likely to be strong and forceful, to try and ensure a more positive overall response to the consultation. The Bedford Park Society (BPS) and local group CHATR are planning a public meeting in Chiswick instead. Local MP Ruth Cadbury has joined Chiswick campaigners against Heathrow expansion who say they are angry at the airport’s failure to hold a local consultation on changes which will significantly affect W4, particularly north Chiswick. The airport’s current round of consultations (Airspace And Future Operations ) features events in Hammersmith, Ealing (Friday 1 February) , and Hounslow Civic Centre (Tuesday, 29 January) but none in Chiswick. This is despite the fact that the area faces significant potential disruption by proposed changes to flight paths or changes to respite periods even without a third runway. Campaigners say the level of low flights directly over the North Chiswick area area could reach 47 per hour (almost 1 per minute). Even without a third runway, Heathrow are asking for another extra 25,000 extra flights, which campaigners say would breach respite periods for those under the existing approach paths. 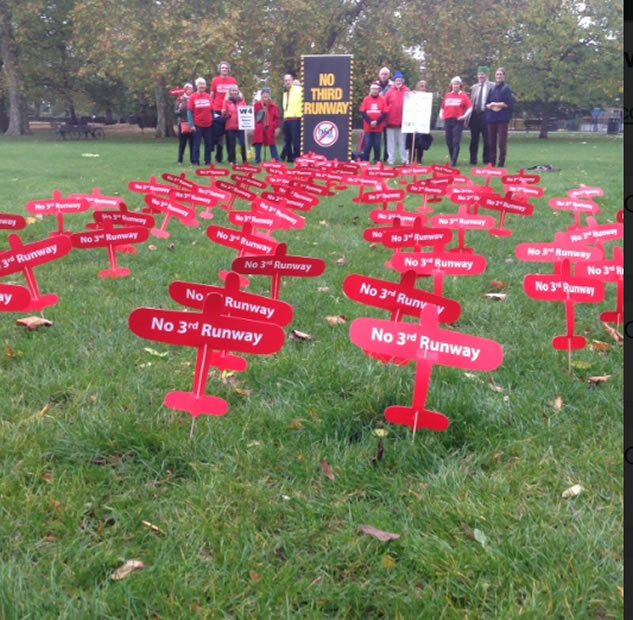 Campaigners against expansion say in Chiswick an estimated 35,000 residents could be affected and claim that Heathrow is avoiding holding events in areas where opposition is likely to be strong to try and ensure a more positive overall response to the consultation. Heathrow Airport has defended its choice of consultation locations and said people also had the opportunity to respond online. The consultation covers a number of topics: Runway Alternation; Airspace changes; Westerly Preference; Night Flights; Extra flights in advance of a third runway. All the proposals assume a third runway will be built. The consultation runs from 8 January to 4 March. Ruth Cadbury MP said she was disappointed with Heathrow Airport and she would work with local groups to see if a Chiswick event could be added. A spokesperson for the Bedford Park Society (BPS) – which covers the area of North Chiswick likely to face considerable noise disruption from early morning flights, said that the BPS and CHATR (Chiswick against the Third Runway) were planning a public meeting in Chiswick. The statement said, “The Bedford Park Society has alerted all its members to the latest Heathrow public consultation and warned them of the major disturbance to all Chiswick residents that the proposed additional flights will cause even if the Third Runway does not go ahead. “We are currently working through the complicated, detailed information in the consultation and drafting a response from the Society. In the next week we also plan to provide some suggested points for residents to make in their response since it’s vitally important as many residents as possible submit their views. “We were concerned to see that the nearest consultation events were in Hammersmith and Ealing but none was planned for Chiswick, which will be so significantly affected by the proposals. It is now clear that the number of low flights directly over Chiswick will be 47 per hour – almost 1 per minute – if the Third Runway is built. “We attended the Hammersmith consultation event on 24 January and together with CHATR emphasised the strength of feeling against the proposals amongst Chiswick residents and strongly recommended that a consultation event should be arranged as soon as possible. Ruth Cadbury, MP, stressed that Heathrow owed it to the community to provide and distribute leaflets for each affected area detailing the impact of the proposed flight paths for each so that people could understand clearly the effect of the proposals. Hacan has outlined a summary of how the changes might affect you and you can also put your postcode into the airport’s consultation document to get information on what is planned for your area. The MP is also organising public meetings with local campaign groups, such as CHATR, BASHR3, NoR3 Coalition and HACAN, in order to speak to local residents about Heathrow’s expansion. If you want more information about the consultation, visit this summary page from HACAN. Wandsworth Council Leader, Ravi Govindia, has urged residents concerned about the impact of a 3rd runway at Heathrow, to attend a Heathrow consultation event that the airport is hosting in the borough this week. They need to make their voice heard. He has criticised Heathrow for having just one such event in Wandsworth, at a location that will be difficult for many residents to access. That is even though the increased aircraft noise would affect hundreds of thousands of Wandsworth residents. The event is being held on 30 January and is open to residents from 2pm to 8pm at the University of Roehampton, SW15 5PH. Councillor Govindia said residents know that a 3rd runway would have a serious impact on the borough. It would produce an unacceptable rise in noise and air pollution, damaging the environment and posing a risk to people’s health and well-being. The Council believes that the impact from additional flights would be felt most keenly in West Hill, Southfields, Earlsfield and Tooting. Currently most aircraft noise from is concentrated over the north of the borough including Putney, Wandsworth and Battersea. Many people will get intense plane noise for the first time. Posted: Wednesday, January 30th, 2019. Filed in Blog, General News, News about Airports, Recent News.